Is there anything better than a good comeback attempt, especially one where everybody involved recognizes the minuscule chance of it being successful, yet wants to give it a shot anyway because what the hell, why not? 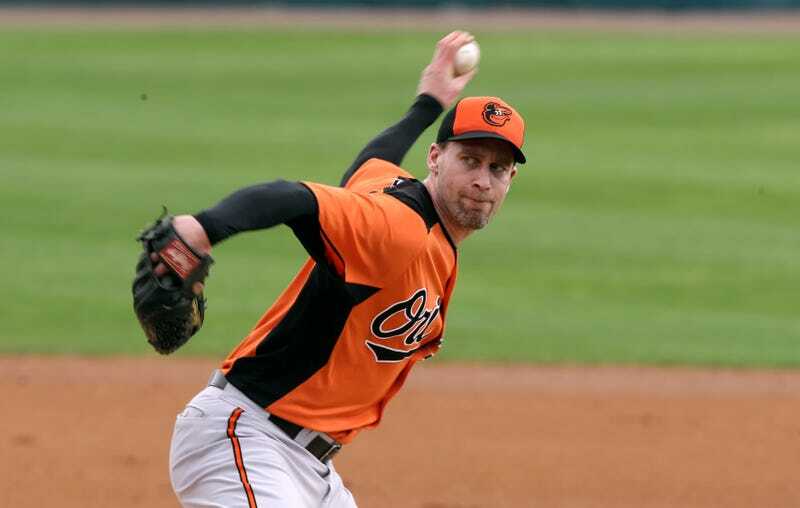 Hope springs eternal in Orioles minicamp, where 40-year-old grandpa and former NBAer Mark Hendrickson is trying to get back into the majors for the first time since 2011. The 6-foot-9 reliever isn't nearly the same pitcher that spent 10 seasons with five different teams—he's a sidearmer now, having converted two years ago on Buck Showalter's advice. He spent 2014 in independent ball, closing for the first time, and says he was humbled by playing alongside guys who'd give their non-throwing arm for a shot at even the minors. So why not give MLB one more go? "I'm a grandfather, for goodness sake, and that was two months ago," Hendrickson said. "Now there's extra motivation. How many active grandfathers have been in the big leagues? Well, that right there is motivation in itself. "Most of it's just unfinished business because it was a challenge that was offered." "He's a straight shooter. He's not doing a charity case. If he doesn't think I can help, then I'm not going to be here. So for me, it's just taking that initiative and saying, 'Look, I don't want to waste your time. You don't want to waste my time. Let's give this a shot.'" Hendrickson, who spent four years in the NBA before his professional baseball career began, was never much more than an innings-eater even in his prime. It's hard to see any way this works out. But that's OK! Everyone seems to be having fun, and how else can any of us survive the long, cold, offseason but by having the biggest dreams?